Welcome to Tarot 101, a comprehensive intro course on the mystery and magik of Tarot. Each week we will explore the in's and out's of the 78 cards which make up the most popular form of divination the world over. This course is designed to be accessible and easy to follow along, as it is structured around establishing an understanding of how to read the cards as a whole, instead of attempting to memorize each individual card's standalone meaning. We will discuss the basics: the history of the tarot, how to interpret the cards, the suits and classes of cards, shuffling the cards and much more. In week two, Cups and the Pentacles, and in week three, Wands and the Swords, we will establish a framework and a template through which each of the the cards can be examined and interpreted both as a single card and as a piece of their suit and their element, tracking their numerological, elemental and astrological correspondences. Attendees are encouraged to bring along a notebook and their own deck. 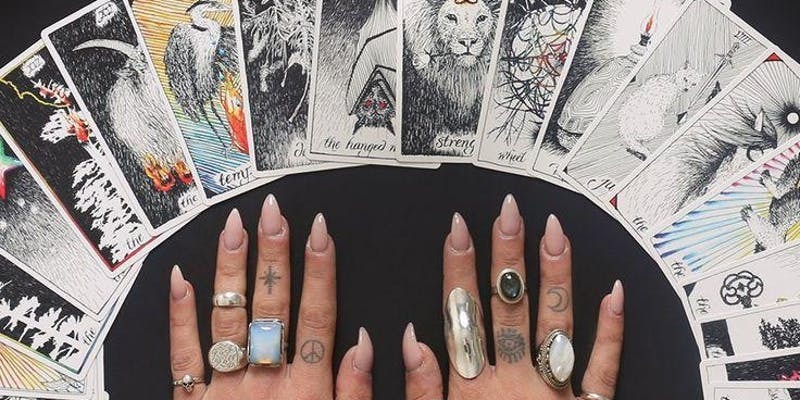 All students will recieve a 10% discount on tarot decks, should they want to purchase one. Dakota is one of Brooklyn’s premier witches, diviners and spiritual workers. They are a reader, educator and co-owner at Catland Books in Brooklyn, NY & the founder of Black Hand Conjure. They have enjoyed international recognition for events like Hex Trump & Hex Brett Kavanaugh, and their work has been featured in The New York Times, Rolling Stone, Vogue, Huffington Post, VICE, Broadly, Buzzfeed, TIME, Newsweek and MTV.